We believe John may have come to Melbourne in December 1913 aboard the Orsova. He lied about his age! John enlisted in the Australian Imperial Force on 2nd November 1914. Despite being 42 at the time he stated he was 37yrs and 6mths, presumably to get under the maximum enlistment age of 38yrs. We know from his enlistment that John was 5′ 10 3/4″ weighed 11st 8lbs, was of Fair complexion with Grey eyes and Sandy hair and had tattoos on both forearms. “The 5th Battalion was among the first infantry units raised for the AIF during the First World War. Like the 6th, 7th and 8th Battalions it was recruited from Victoria and, together with these battalions, formed the 2nd Brigade. What happened to 5th Battalion at The Landing at Gaba Tepe? We don’t know exactly what happened to John Horton. We presume he landed on the northern end of the front with the 5th Battalion and 2nd Brigade Headquarters from the Novian which was late to reach the “Beach” on the morning of the 25th of April. The Novian was meant to precede the Galeka containing the 6th and 7th Battalions but ended up landing after them. A detailed description of The 2nd Brigade’s day on April 25th 1915 is contained in C.E.W. Bean’s Official History of Australia in the War of 1914-1918 Vol.1 Chapter XVII – The Second Brigade on the “400 Plateau”. It makes for fairly grueling reading and other Chapters can be found at the Australian War Memorial site HERE. We know John Horton was wounded at Gaba Tepe and was cleared from the battle on the Lützow. On the 27th of April 1915 the Lütsow, Itonus, Ionian, Clan Macgillivray, and Seang Choon with 2,500 wounded were sent off to Alexandria. “Aboard the improvised “hospital carriers” conditions existed which may scarcely be described. The Clan Macgillivray and the Seang Choon were probably the best staffed of the original transports. Yet the Clan Macgillivray carried 850 wounded with only two doctors, and the Seang Choon, packed in every space with from 600 to 800 wounded, had only three. The broken men were lucky if they had a hard table to lie on for the next four days, with lifebelts for pillows. The endless stamping of horses in the Lütsow prevented sleep. The Derfflinger, despite the protest of Major Millard that she was overcrowded, took 500 cases, and sailed with three doctors to Alexandria. By the second day at sea thirty men had died aboard her. In the Mashobra many of the wounded had no blankets and no food. In some ships there were no conveniences at all, and newspapers had to serve for utensils of health and cleanliness. In the Lütsow not even paper was obtainable, and there were only four bed-pans, stolen from another ship, for nearly 800 patients. 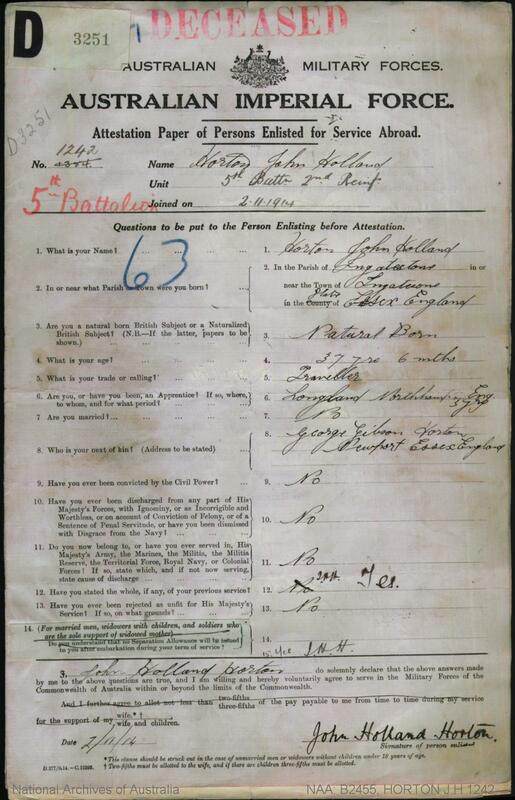 John Horton was admitted to No.15 General Hospital, Alexandria Egypt on 30th April 1915. On 4th May 1915 at 11:30pm Private John Holland Horton died of wounds to the spine. John was buried in the Alexandria (Chatby) Military and War Memorial Cemetery in Egypt on 5th May 1915. The connection we have to John Horton is a letter in his personnel records held at The National Archive. The letter is from C.H.Morgan to the Army requesting an address for John Horton’s next of kin. Apparently the Shire was presenting certificates to all those that enlisted from the area and the letter suggests that John Horton was at Portsea when he enlisted. There is more to learn about this Englishman that came to our country, joined our forces and died fighting with our countrymen all in the space of seventeen months.